As an employer looking to recruit indispensable talent for your company, you’ll find our Career Fairs to be a valuable resource to connect with our students. Employers consistently give us feedback that WPI students they’ve hired have the technical, people, and leadership skills to hit the ground running and tackle complex problems. The Career Development Center (CDC) hosts multiple in-person and virtual Career Fairs for WPI students and alumni to learn about full-time, part-time, summer internship, and co-op opportunities. A great way to meet and recruit key talent from all WPI disciplines, attending a Career Fair will also increase your organization’s visibility on campus. Capacity has been reached for this event and registration is now closed. Gompei is ready to go and is dressed for success on the day of the Career Fair! 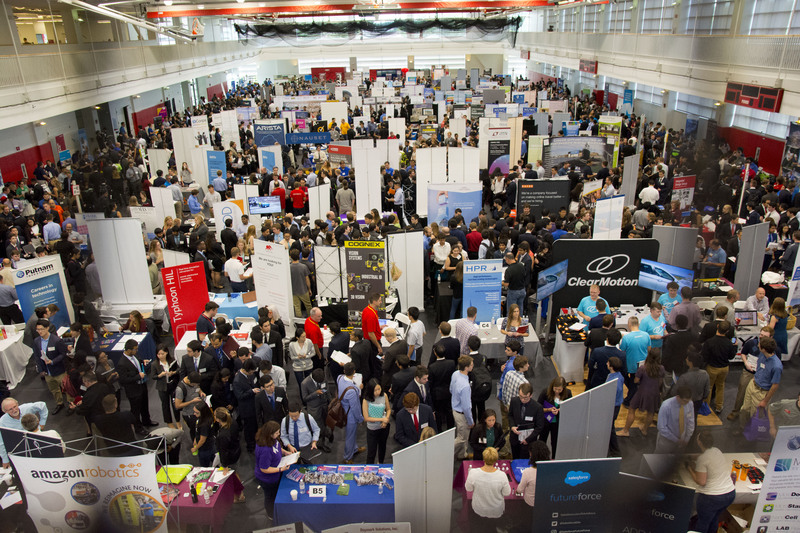 Hear from employers and students about the value of attending a WPI Career Fair. Employers also share about the unique combination of skills that WPI students bring to their organizations. Logistics. Wow, WPI really knows how to put on a career fair! I was blown away by how well-organized the event was. We met a lot of really well-qualified students, and we felt that the career fair really put Disney on WPI students’ map as an employer. WPI students are, by far, the most well-prepared for the work force of all the college fairs I attend. Not only their educational experience, but also their ability to interact on a personal level. The students come to the fair well prepared with a good resume and are able to communicate their interests in an internship. The students seemed to be better prepared than other colleges. The fair itself was well organized. Everything that I was involved with went very smooth. Once your registration is approved, you’ll receive a confirmation email and invoice within three business days. If you need to make changes, additions, or deletions, call the Career Development Center at 508-831-5260. You’ll receive an email with all logistical information two weeks before your selected Career Fair, which will include detailed parking instructions and other relevant information. We suggest that your corporate representatives carpool, if possible. When you arrive, student volunteers will be available to assist you with unloading materials and any setup needs you may encounter. Your approximate space size will be 8’—a 3’ x 6’ table and two chairs will be provided. To ensure productive conversation during the fair, please post jobs in Handshake before the career fair! Students will be researching company opportunities and applying to jobs before and after the career fair. For the best candidate pool, make sure yours are posted with WPI! If you are planning to ship your materials back to your company after the job fair, you must bring the necessary completed forms. A separate form must be attached to each package, and all packages must be brought to the shipping table area before you leave the fair. All employer representatives will register the day of the fair. Please bring your business cards to expedite the check-in process. If you have any questions or concerns, call the Career Development Center at 508-831-5260 or email cdc@wpi.edu.